it took more than 36h in total to print it. Thanks for the feedback. I'm wondering if your train has a different wheelbase, as I have not experienced this issue myself or seen any other reports of it. its the order of the trailers. as the ramp Is quite steep, the train and a large coach collide in the roof area. to avoid this, I changed the order of the coaches and the train can travel the bridge. 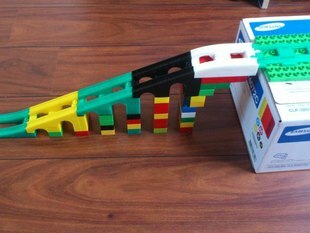 By adding some lego duple bricks under the bridge, the bridge is high enough that a train can pass underneath.